Well of course it's all about the Fostex VF-16 and VF-160 Digital Multi-trackers and those of us who have purchased them and are making good use of one in our respective home and project studios. This web site is also for those people that are interested in buying this unit but would like to know more about it before laying down the bucks. I hope this site is found to be an excellent resource for all VF-16'rs and VF-160'rs. 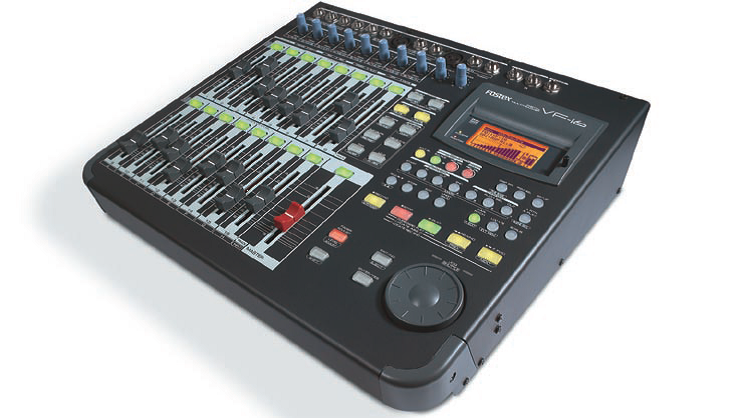 Direct Mode: If you want to record 8 inputs simultaneously to 8 recording tracks this mode routes the inputs directly to the digital recorder via trim pot, bypassing the mixer. Rec. Buss Mode: Alternatively you can record multiple inputs to 2 recording tracks using the digital mixer to set levels, EQ, effects, etc. But all of this flexibility counts for nothing if it's let down by the quality of the audio. No chance. This high specification machine records true, CD-quality uncompressed digital audio. Naturally, as the VF-16 uses a digital non-linear recording system, full Copy, Paste, Move & Erase editing with Undo & Redo is achievable. Ease of editing is aided by the ability to display scrubbed audio graphically, making 'on-the-fly,' intricate edit points simple and intuitive to designate. Plus, with clipboard data available to be pasted to the same, another, or multiple tracks and automatically repeated up to 99 times, you can become a re-mix wizard in a matter of minutes. And if you thought that was cool, wait 'till you hear that the VF-16 can export and import audio (all tracks, one track or any part of a track) as standard .WAV files via SCSI meaning that editing, processing, and sound file conversion can be accomplished using popular PC music software.